018-Kit Features: -Set included: (2) DuraBoard polypropylene pegboard, (4) 1" Single Rod 30° DuraHook, (2) 2.5" Single Rod 30° DuraHook, (3) 0.75" DuraHook Pliers Holder, (2) 2.75" Double Rod 80° DuraHook, (3) 0.25"-0.5" DuraHook Ext Spg Clip, (2) 0.25"-0.5" DuraHook Std Spg Clip, (2) 0.5"-1" DuraHook Std Spring Clip, (3) 2.25" Curved DuraHook, (1) 2.88"-1.75" U-Shape DuraHook, (1) Pegboard Spacer Kit for installation. -Ideal for laundry room, sewing room, craft and hobby rooms, garage and shop for storing work items and parts. -Innovative double locking system locks the DuraHook(s) in place with a locking tab that mounts to the pegboard from the front. -No need to buy wood framing or hardware as steel spacer kit is included to mount the DuraBoard pegboards. -Washable, weather and impact resistant and will stay looking new through many years of service. 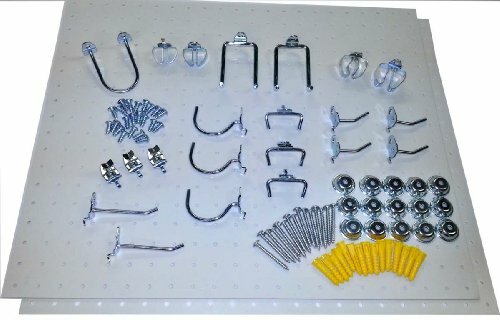 -With 22 Peice Durahook assortment and wall mounting hardware. Part Type: -Accessory Kit/Hooks. Wall Type: -Pegboard. Dimensions: Overall Height - Top to Bottom: -18". Overall Width - Side to Side: -22". Overall Depth - Front to Back: -0.13". Overall Product Weight: -7.04 lbs. If you have any questions about this product by Triton 2, contact us by completing and submitting the form below. If you are looking for a specif part number, please include it with your message. ZONYEO White Grid Panel Display Hooks, Grid Hook for Gridwall, Display Hooks for Panel 2.56" 2.76"